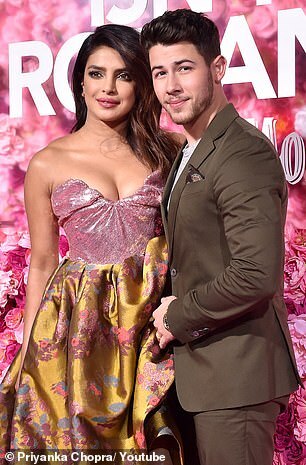 Priyanka Chopra has revealed how her marriage to Nick Jonas has left her feeling as though she is ready to move on to the next chapter of her life – while admitting that she isn’t actually sure what that entails. Speaking candidly as part of a new YouTube special, If I Could Tell You Just One Thing, the 36-year-old opened up about her doubts and insecurities regarding the future, while seeking some life advice from inspirational female leaders. During the show, Priyanka, who tied the knot with Nick Jonas, 26, at the end of last year, sat down to talk to fashion designer Diane von Furstenberg, U.S. Olympic gymnast Simone Biles and actress, rapper and comedian Awkwafina. The purpose of the show was for Priyanka to find advice and inspiration from the three ‘extraordinary’ women. She asked each of them to tell her the one piece of advice that has shaped each of their lives. ‘I’m in my mid thirties. I’m trying to figure out where I go next, what I do next, what is the next phase in my life,’ she said, while explaining the purpose of her seeking advice from the three women. So the actress decided to turn to some of the world’s most inspirational women in order to ask their best piece of life advice, in the hopes that it might help to guide her – and her viewers. Priyanka first spoke to U.S. Olympic athlete Simone Biles, who was among more than 260 young women who were sexually abused by former USA Gymnastics team doctor Larry Nassar. 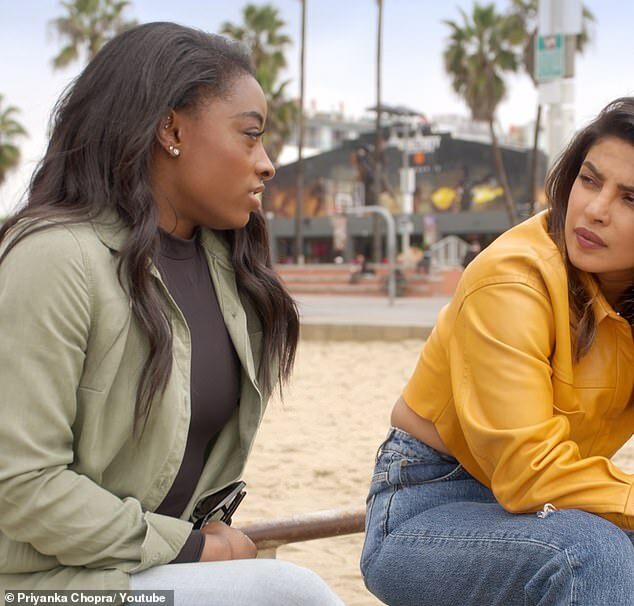 Simone, 22, has since spoken candidly about the abuse and how she has continued to deal with it – a topic that she discussed again with Priyanka, while the two spent time walking their dogs along Venice Beach. 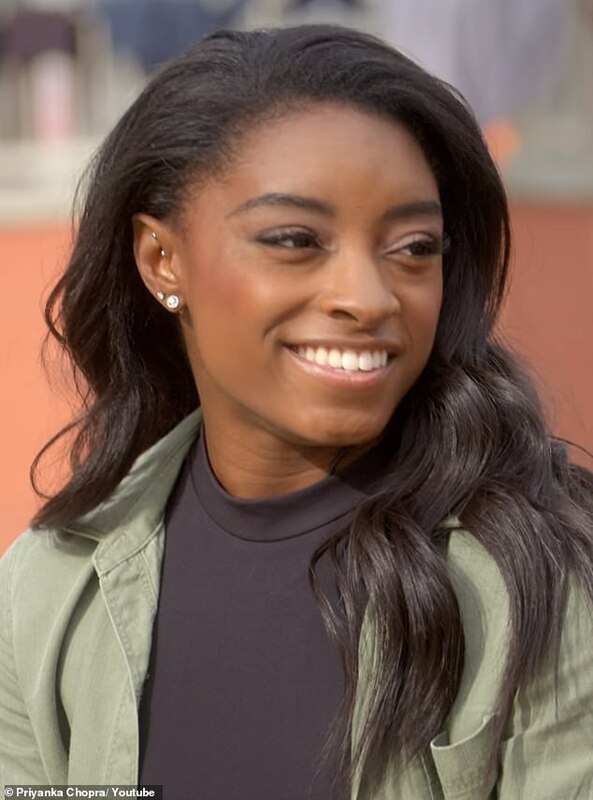 When asked about the best way to deal with pressure, the gymnast said ‘therapy is everything’, as she said she regularly visits a therapist to talk about a number of issues. The gymnast also reveals that the pup she has with her is actually an emotional support dog. ‘It all comes back to my childhood and everything that has happened to me,’ Simone says of her trips to a therapist. ‘Being sexually abused, and all that stuff. The gymnast, who first revealed she had been sexually abused by the coach on the eve of his sentencing in January 2018, told Priyanka that she ‘brushed it off’ for so long because she didn’t want people to see her as a survivor of sexual abuse instead of a gymnast. She also spoke about the pressure that she has dealt with as a gymnast, revealing that she struggles to cope with the weight of expectations – both her own, and those placed on her by others. ‘I feel like always meeting people’s needs, every day, all the time, is probably the hardest thing I go through,’ she confessed. ‘I feel like if I don’t meet [other people’s] needs then I’ve failed, even at the Olympics. Everybody wanted me to win six golds, or this or that, and I didn’t meet those needs – and I was really down on myself. Revealing her one piece of life advice, Simone said she would urge others to take risks. ‘In 2018, I took a lot of risks and I did things that terrified me. It made me realize who I was as a person,’ she said. 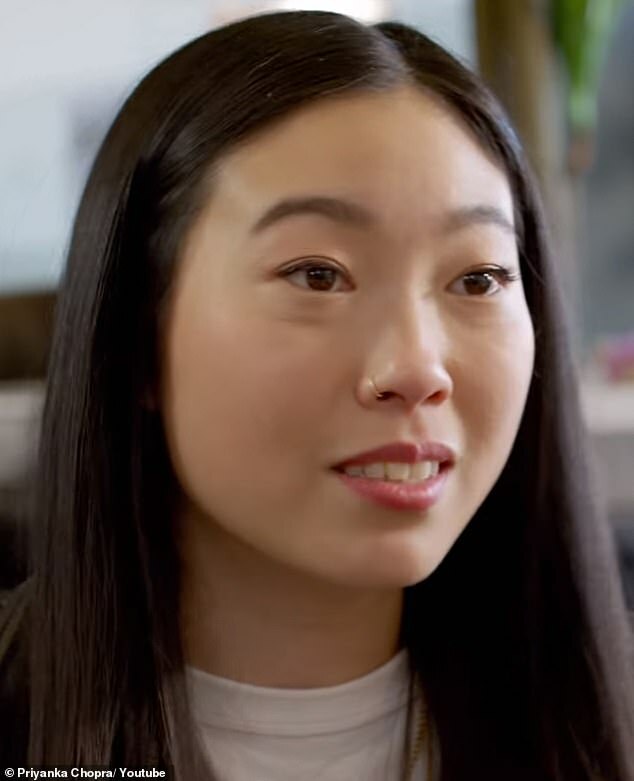 Next up was Awkwafina, who is an actress, rapper, comedian and YouTube star. The 29-year-old told Priyanka that she developed humor as ‘a defense mechanism’ after her mother died, as she said she didn’t want to be an ’emblem of sorrow’. 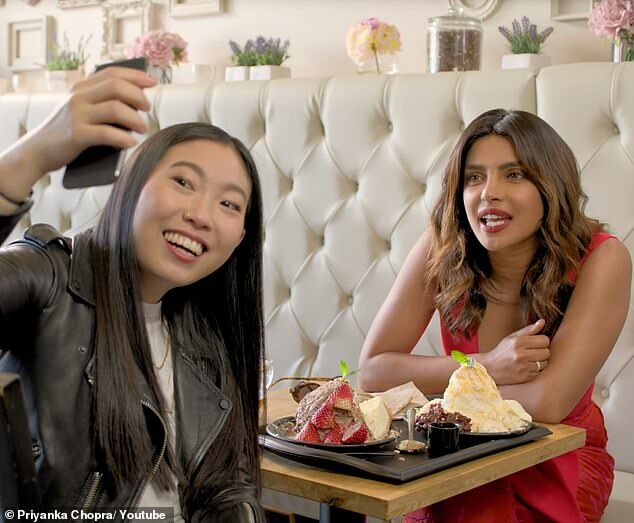 The star, who has starred in Ocean’s 8 and Crazy Rich Asians, told Priyanka a piece of advice that was given to her by her grandmother, which Awkwafina says she ‘lives and dies by’. Finally, Priyanka spoke to 72-year-old fashion designer Diane von Furstenberg. ‘I wanted a man’s life in a woman’s body. That was my dream,’ Diane said, while opening up about her failed marriage to Prince Egon von Furstenberg – who she married when she was 22. 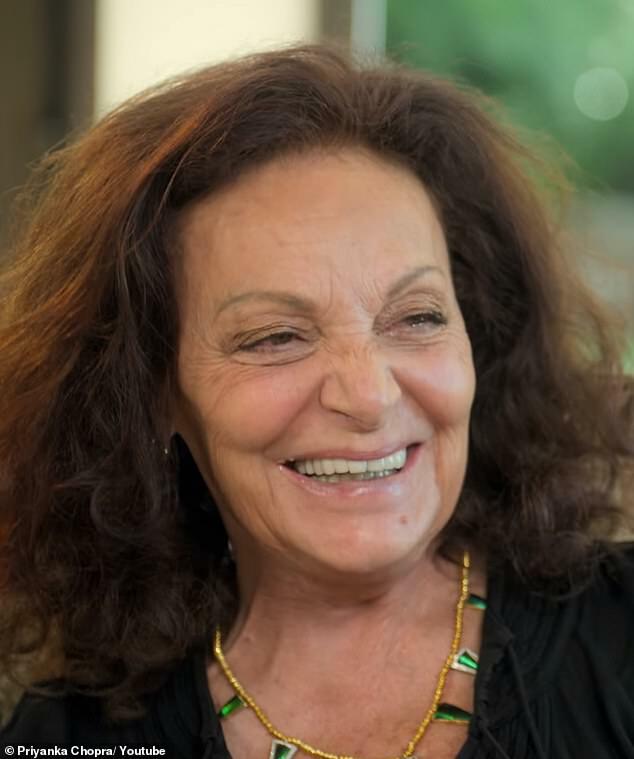 Diane, who said she is ‘very happy’ she had ‘a lot’ of affairs with other men, said: ‘At my age now, I want to use my voice to tell all women that they too can be the women they want to be. ‘They can, because I’ve never met a woman who is not strong. They don’t exist. Women should know that they are strong,’ she added. Giving her most valuable piece of advice, Diane said: ‘The most important relationship in life is the one you have with yourself. 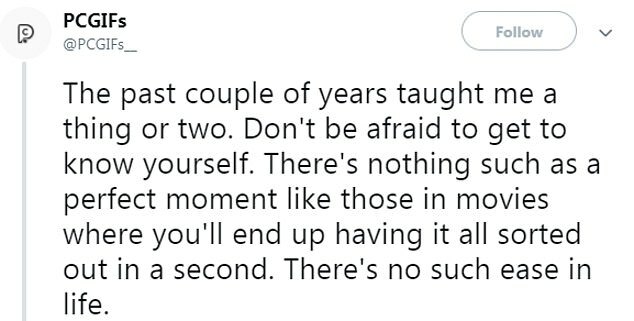 ‘There’s no other advice that is more important than that. Relationship number one is the one you have with yourself,’ she added. 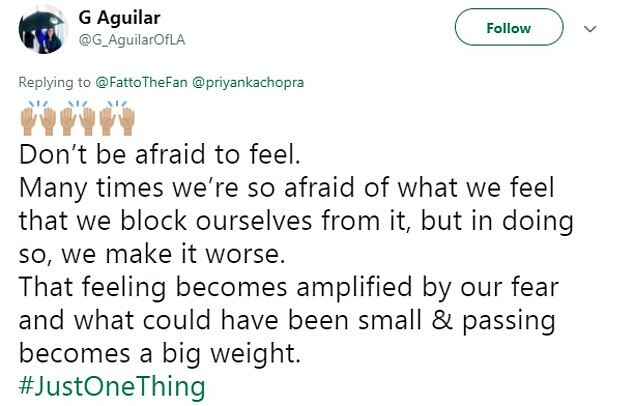 She continued: ‘Liking and loving yourself doesn’t mean you are so pleased with yourself, it is just owning who you are. 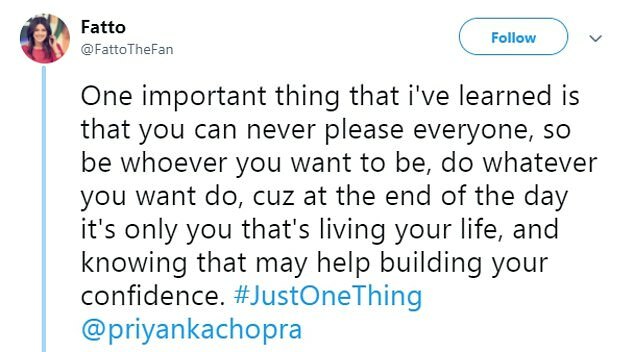 And since the YouTube special aired on Wednesday, fans and viewers have gotten involved as they started sharing their own personal life advice on Twitter. Twitter user @PCGIFs__ said: ‘The past couple of years taught me a thing or two. Don’t be afraid to get to know yourself. There’s nothing such as a perfect moment like those in movies where you’ll end up having it all sorted out in a second. There’s no such ease in life. ‘No matter what you need to talk to yourself, understand your truth even if it’s an ugly one, embrace it and work at it till you’re free from all that’s stopping you. ‘Only then you can move forward and be happy. Go create your perfect moment or else wait forever,’ they added. 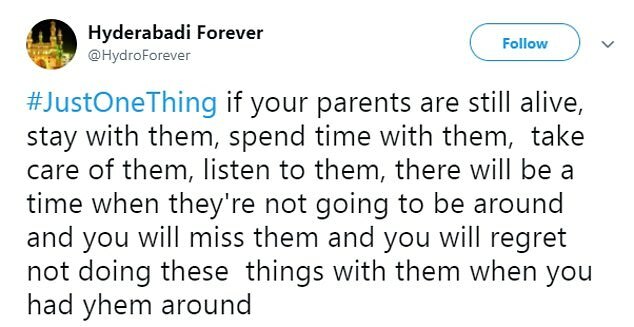 ‘#JustOneThing if your parents are still alive, stay with them, spend time with them, take care of them, listen to them, there will be a time when they’re not going to be around and you will miss them and you will regret not doing these things with them when you had them around,’ added user @HydroForever. Others took to Twitter to praise the production, with many wondering if there will be further episodes released in the future. 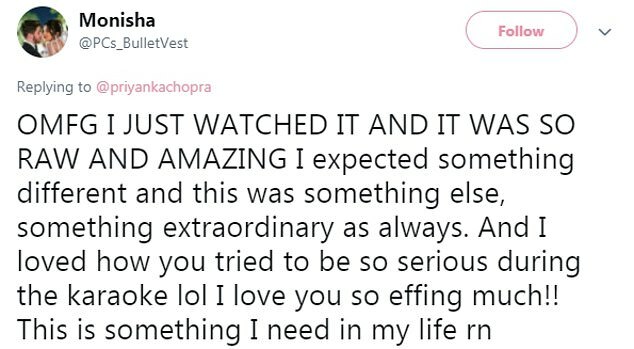 A third user took to Twitter to share the positive impact the show had on her life. User @PCs_BulletVest said: ‘OMFG I JUST WATCHED IT AND IT WAS SO RAW AND AMAZING I expected something different and this was something else, something extraordinary as always. ‘And I loved how you tried to be so serious in the karaoke lol I love you so effing much!! This is something I need in my life [right now],’ they added.